The moderation madness will multiply in 2010 and 2011. Gustav Mahler was born in 1860 and died in 1911. Double anniversary cycles of his symphonies will tick all the boxes for the modish mass of music moderators. Besides, what an opportunity for Gilbert Kaplan to expand his repertoire. The BBC moderators have decided that classical music died together with Mendelssohn in 1847. So Bohuslav Martinů has been written out of history, despite 2009 being the fiftieth anniversary of his death. But fear not, a moderate amount of Martinů will feature here. As I said some time back - more of Martinů's music please. Now playing - Bohuslav Martinů's Symphony No. 4. For me this is one of the great life-affirming works of the 20th century. I grew up with Václav Neumann's account from his complete cycle of the symphonies on vinyl LP. The box is seen above, my discs still sound superb despite the variable quality of the Czech Supraphon pressings. This set is now available as three CDs and is highly recommended. Why, with the current obsession with all things Shostakovich, do the myopic moderators ignore Martinů's equally deserving music? 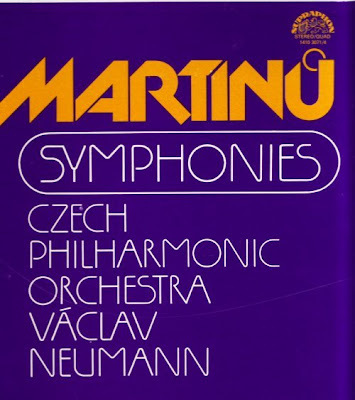 Is there an orchestra immoderate enough to programme one of Martinů's two quite superb, but virtually unknown, cello concertos instead of the ubiquitous Shostakovich alternatives? Not quite as authentically Bohemian, but recommended nevertheless, are Bryden Thomson's recordings of the Martinů symphonies with the Royal Scottish National Orchestra from the late 1980s. These are available from Chandos as MP3 downloads. Bryden Thomson's early death in 1991, aged 63, was a sad loss. If he is remembered at all today it is as a British music specialist. But these Martinů symphonies are confirmation that such a categorisation is grossly unfair. He also recorded a fine cycle of the Nielsen symphonies for Chandos with his Scottish orchestra more than a decade before the composer's music was 'approved' by the moderators. Another Nielsen champion and victim of BBC moderators here. The world would be a better place with less Mahler and more Martinu. following your link to the Chandos Martinu Symphonies in download, I note that they are not MP3. Instead they are lossless, i.e. genuine CD quality sound. Impossible to resist, I should say! Michael, you are quite right. The Chandos site is not the easiest to navigate; but I think the Martinů symphonies, and all Chandos releases, are available in MP3 or higher quality lossless download formats. Here's another vote for More Martinu! Emanuel Ax just played the 4th Symphony at the San Francisco Symphony and I adored it. Even got to hang out at the rehearsals because I was supposed to interview Mr. Ax, which I did for all of about three minutes (I was nervous, he was busy). Dear Pliable: Let me make a correction to my last comment where I absurdly confused two Eastern European composers. Emanuel Ax played the 4th Symphony of Karol Szymanowski rather than Martinu, but my statement still stands. More Martinu! And more Szymanowski while we're at it. Mike, please don't apologise for introducing a discussion about the music of Karol Szymanowski. His music should be played instead of the absurd overdoses of the output from anniversary composers that we are being subject to. The 70th anniversary of Szymanowski's death passed virtually unnoticed last year. Some time back there was an excellent budget Decca double CD that coupled Szymanowski's Symphonies 2 & 3 and his Violin Concerto 2 with works by Witold Lutoslawski. I bought my copy in 1996 and it plays as I write. Alas, and like so many other fine discs, it is deleted. But it is available from some re-sellers at a reasonable price. Other Szymanowski recommendations very welcome. One of the most delightful aspects of following music blogs such as OAOP is that I am inspired to listen to a piece of music or a composer again who I may have neglected for a spell. I too have the Neumann set on LP, but hadn't listened to any of Martinu's symphonies for a while. I pulled it out last night, played the 4th and thoroughly enjoyed it. But, while a good performance, I have to say that it's fairly lackluster recording in my opinion. I also have Weller's recording of the 4th with the Royal Liverpool Phil so gave that one a spin: much better! Then on to Mackerras' recording of the Double Concerto with the Prague Radio Sym. All in all a wonderful evening of Martinu! Thanks! Don't forget Martinu's operas either. "Julietta", "Comedy on the Bridge", and "Ariane" are three that I get played every now and then around here. Thanks for posting this - I did want to note that Columbia Japan has reissued the Martinu Neumann set as a 24-bit remastered package, and I think the sound was improved significantly.